Happy Friday everyone! Today I’m sharing all the cute Fall sweaters that are on my lust list. Fall is my favorite season when it comes to Fashion because it’s the only season you see so many colors. 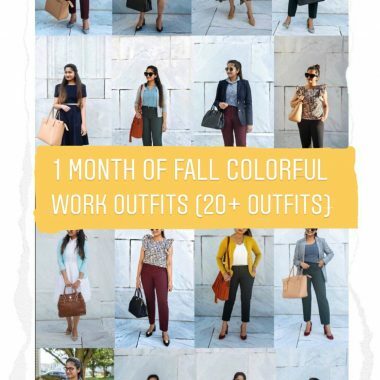 It’s the best time to stock up on your favorite colors or colors that you don’t already have in your closet. I am absolutely adding this purple turtleneck sweater, turquoise sweater, plaid sweater, camel poncho, and this square neck sweater with pearl cuffs to my fall wardrobe. Pearl and button cuff sleeves are absolutely trending right now along with all things plaid. I bought this bell sleeve sweater which I’m totally in love with, it’s currently sold out but I am hoping it will be restocked it soon. I also have this chocolate brown turtleneck sweater from Chadwicks of Boston which pretty much goes with any color. I am leaning towards more brown and purple shades this season. You will see more of it in my Fall mood board post coming next week. Talbots – 25% off entire purchase- I bought another pair (in acorn color) of my favorite trousers (featured in this post; also comes in curvy style), these pumps, eyelet top, wool coat and the sweater that is featured above. Madewell– denim sale upto 30% off- this high waisted denim always gets sold out in my size. I have these cali bootcut jeans in white, absolutely love them. JCPenney —Take 60% off when you spend $100 or more, or 40% off when you spend $40 or more. Valid through 9/26. Loving these cute fall sweaters? Click here now for more of my favorite Fall fashion!